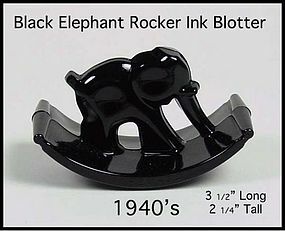 This 1930s-1940s black elephant rocker blotter was used to dry up excess ink while writing.... Excellent condition! 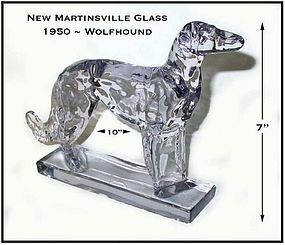 This glass animal figurine was made by The New Martinsville Glass Co. in the 1950's. 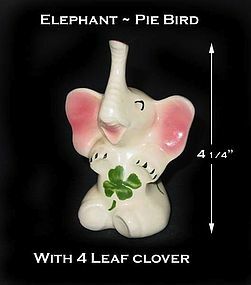 The figurine is in great condition, but there are some minor chips on the base that could be ground, or they can be displayed and used as they are. There is a slight lavender color on the figurine. We have 2 of these available. Very bright and sparkly glass. 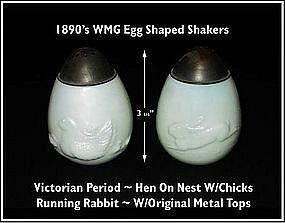 These Running Rabbit/Sitting Hen WMG tall shakers were made by The Eagle Glass Co. in the late 1800's and early 1900's. Each shaker has a running rabbit on one side, and a sitting hen with chicks on the other side. These are very old shakers and very well done! One of them does have a hairline at the top. The lids, which are original, are very hard to find for these shakers. The photo does not begin to show the quality or beauty of these shakers.